Although Christmas is well past, it’s been only a week since many people got back to normal, so attached are the English to festivities at the turn of the year. It’s not a new phenomenon. From Elizabethan times, and probably well before, it was traditional to take a break from unnecessary work just when nature itself seemed to be at rest. This gorgeous image of a team of oxen drawing a plough is an illustration of January from an Anglo-Saxon calendar held at the British Library. I’m indebted to Eleanor Parker, who tweets as @ClerkofOxford, for this image and for information about Plough Monday. 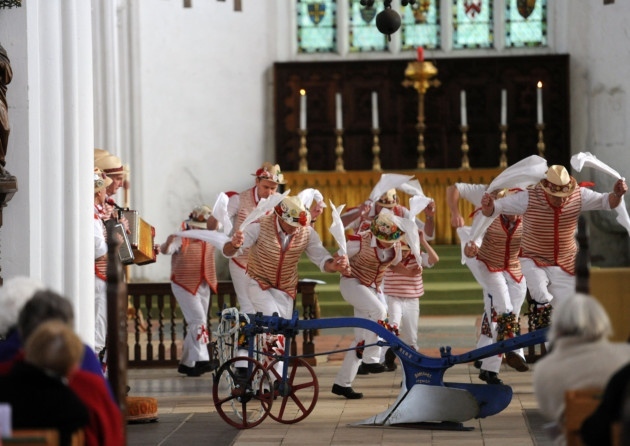 While reading up on Plough Monday and traditions associated with it, I came across references to Distaff Day, also known as St Distaff’s Day and Rock Day. 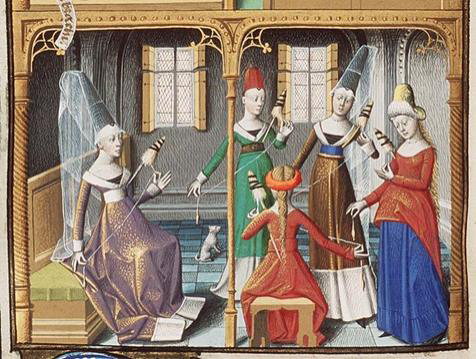 This was 7 January, and was when women began their task of spinning again after the holiday period. Although spinning wheels were in use, spinning by hand using a distaff and spindle remained the most common way of spinning thread, and using a distaff was always a woman’s task. There was other jollification too. Thanks again to Eleanor Parker for the link to an early twentieth century book Examples of Printed Folk-lore concerning Lincolnshire, collected by Mrs Gutch and Mabel Peacock. This gives examples of Plough Monday plays which were particularly prevalent in Nottinghamshire, Leicestershire and Rutland. These, described as “the most elaborate of all English seasonal folk-drama” resemble the much more widespread Mumming Plays, generally including a Fool character, a combat and revival sequence, ballads, dancing and costumes decorated with ribbons. Plough blessing in church, Thaxted, Essex, 2016, with Morris Dancers. Hath rotted ere his youth attain’d a beard. The Christmas period was marked at court too: entertainments of many kinds, including plays, took place until Twelfth Night when order was restored. Shakespeare’s play Twelfth Night celebrates the topsy-turvyness of this time of year, though its plot and characters don’t obviously relate to the date itself. Reading about Distaff Day though, I wondered whether he might not have been thinking about this traditional day when Toby Belch bawdily describes Sir Andrew Aguecheek’s hair: “it hangs like flax on a distaff; and I hope to see a housewife take thee between her legs and spin it off”. This entry was posted in Legacy, Shakespeare's World and tagged @ClerkofOxford, A Midsummer Night's Dream, British Library, Christmas, Distaff Day, Eleanor Parker, Plough Monday, Robert Herrick, Thomas Tusser, Twelfth Night. Bookmark the permalink.